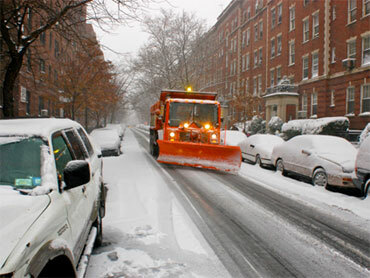 The 2010 holiday blizzard that slammed the Northeast did not just slow down business and traffic, it also lead to a few deaths in New York City as emergency services struggled to reach victims on unplowed streets. It turns out, however, that the city's Sanitation Department, which is responsible for plowing streets, was not completely overwhelmed by the nearly two feet of snow that blanketed the area. The New York Post is reporting that Sanitation Department bosses in New York City's outer boroughs ordered their drivers to slow snow removal in protest over a raft of demotions, attrition and budget cuts. City Councilman Dan Halloran, R-Queens, told the Post that he was visited by guilt-ridden sanitation workers who told him about their bosses' plot. "They sent a message to the rest of the city that these particular labor issues are more important," Halloran told the Post. "They were told [by supervisors] to take off routes [and] not do the plowing of some of the major arteries in a timely manner. They were told to make the mayor pay for the layoffs, the reductions in rank for the supervisors, shrinking the rolls of the rank-and-file." Halloran said he met with three plow workers from the Sanitation Department -- and two Department of Transportation supervisors who were on loan -- at his office, the Post reports. The tactics used to slow cleanup included keeping plows slightly higher than the roadways and skipping over streets along their routes, the Post reports. In the last two years, the agency's 6,300-person workforce has been slashed by 400 trash haulers and supervisors and, effective tomorrow, 100 department supervisors are to be demoted and their salaries slashed as an added cost-saving move, the Post reports.